Today we celebrate Earth Day, and every day we do the work. I am sharing this relevant message from the time of the inception of Wild Love, which is an extension of my artwork in the studio. "I am all the forces with which I come in contact. I am the wind and the rain. The stars, the light, the in between. The waves, the trees, the animals and winged ones. The thundering hooves. We are one. Resonate with One. May your days be filled with good energy and the joy of new and deeper truths and discoveries. May eyes, hearts and arms open to the reality of the family we are: reflections of one another. One, simply in different packages - whether you or I, he or she, the animals, birds or trees, the water, the wind. May the wild, stay wild. The free, roam free. May the thrill of Universal oneness fill all with compassion and understanding, rising above all drawn lines. May all humans, the two-legged ones, come to fully understand that we are but a mere part of the whole, and that within that whole lies a very delicate balance, which must be respected, now and forever, for all generations to come. As humans we have a responsibility, and we have a choice. To walk this earth must not be taken for granted. It is our responsibility to protect and care for the land. To respect the earth and all its’ inhabitants, acting with conscience and awareness. One does not harm that which one respects, for it is understood one only harms oneself in the process, and in turn impacts the whole. Wild Love Preserve is thrilled to announce an extraordinary honor this Earth Day. 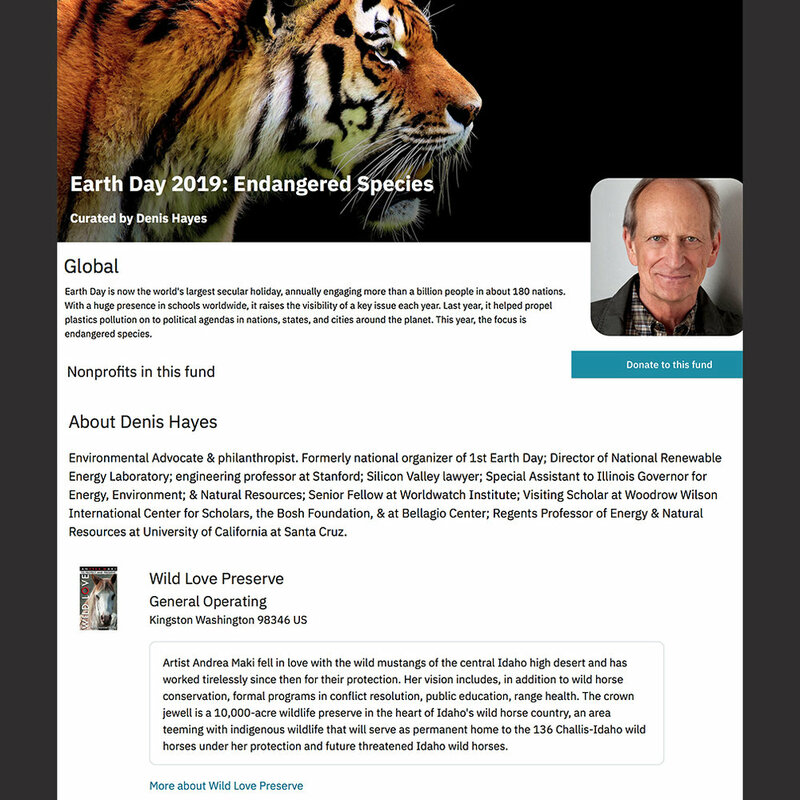 Denis Hayes, the Founder of Earth Day, and President and CEO of the Bullitt Foundation, has selected Wild Love Preserve to be featured in his Earth Day 2019 Profile Fund of well-respected nonprofits to support. Denis Hayes, like Stone Gossard and Pearl Jam Vitalogy Foundation, recognize the way in which native wild horses lead our way to protecting indigenous ecosystems as an interconnected whole, and our appreciation is truly beyond measure. Thank you for joining Denis Hayes in supporting Wild Love Preserve and for considering a tax-deductible donation this Earth Day 2019! Repost of "Not A Fan Or An Apologist"
Numerous conversations have followed the Bureau of Land Management's National Wild Horse and Burro Advisory Board Meeting from October 2017 in Grand Junction, Colorado. This nine-seat volunteer advisory board is to represent all stakeholders and provides their recommendations in regards to the BLM's methods of management of America's wild horses under the 1971 Wild Free-Roaming Horses and Burros Act. Recently I was asked again why the Advisory Board was apparently quick to dismiss discussion of Wild Love Preserve's model in addressing all facets of regional wild horse population on home turf. I cannot speak for board members, nor was I able to be in attendance for the October meeting, however, I thought to share my March 2017 response to the Advisory Board, when I was questioned as being an apologist, or fan, of one stakeholder over another. See WLP focal points below. Learn more about our collaborative range-work at Wild Wilds. • Success requires fluid co-existence between stakeholders, vested interest by the region, community engagement and benefit. • Humane, fiscally responsible, sustainable population management, Native PZP-1YR. • Nurture the legacy of western wild horses in conjunction with all indigenous wildlife species within this unique ecosystem on our public lands. • Fluid co-existence with livestock where applicable. • Support a healthy, genetically viable native herd and ecosystem, in a lasting manner for future generations to equally experience, nurture, treasure. Learn more about the mission of Wild Love Preserve. Nine years ago today in Idaho, things changed. It is in this exact moment, which I caught on film back on April 1, 2010, that I made a promise to 21 adopted Challis wild mares from the 2009 roundup, that I would do what I could, if anything, to help them find their way back to their home turf, albeit under new circumstances. I figured it would be a couple weeks or maybe a month of my time, and it offered me a little distraction from hospitals with my mom’s health situation. 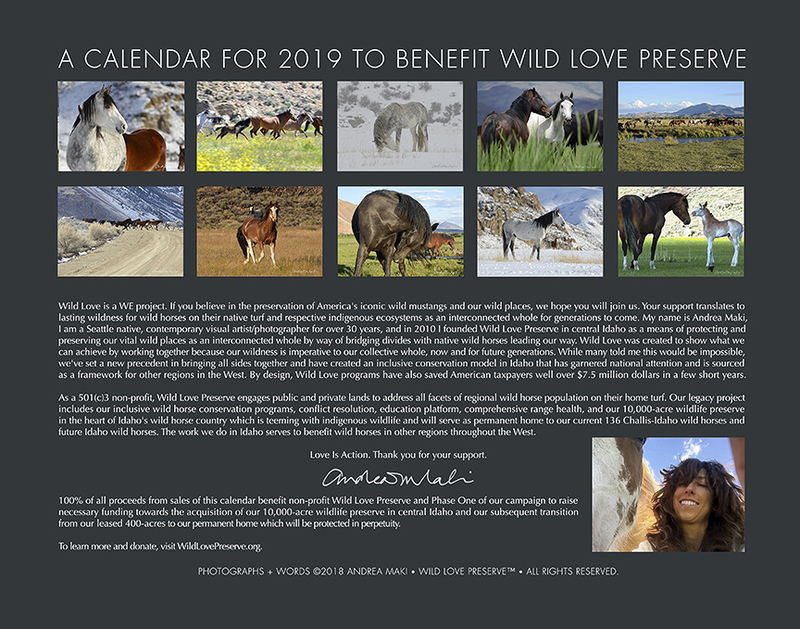 Never could I have imagined it would lead to Wild Love Preserve, and more so, that our mass adoption of all the 2012 Challis wild horses made available by the Idaho BLM on Jan 13, 2013 would happen only a few days following my mom’s crossing. Alas, my mom wasn’t about to miss the events and was sure to make her presence known and help things run smoothly. Over the last nine years we’ve saved hundreds of Idaho wild horses on their home turf and helped others in other parts of the country. Indeed, it’s wild love. Together, we keep the wild, wild. 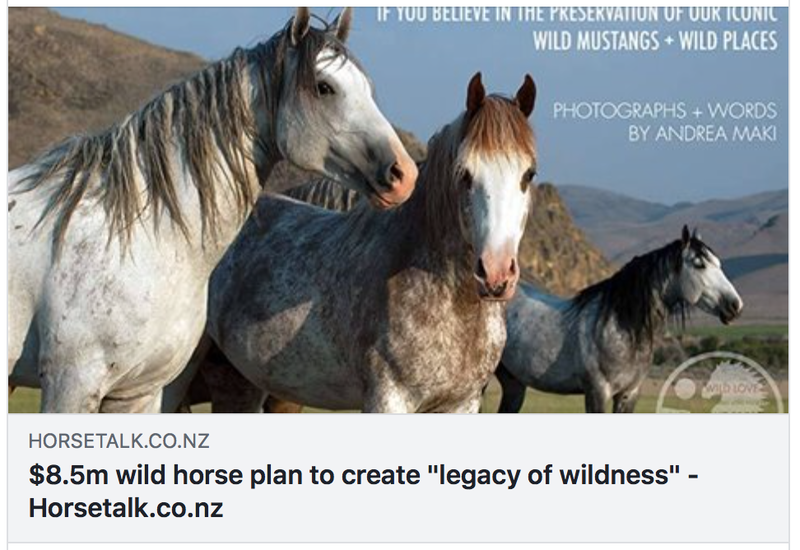 Stone Gossard and Pearl Jam's Vitalogy Foundation have committed $20K towards Wild Love Preserve’s campaign to preserve western wild horses in their native habitats and nurture the legacy of indigenous ecosystems as an interconnected whole. Will you JOIN STONE + PJ AND help us meet our GOAL to raise $75K by March 16? We celebrate, recognize, appreciate, respect, and believe in the love, power, and inherent strength of all ladies, two-legged and four, winged and finned, young and old. Happy International Women’s Day from the wild side! For those who have asked us about trimming our wild horse’s hooves... To meet BLM requirements at the time of our mass adoption following the 2012 Challis Roundup, Wild Love had to purchase this custom-built wild horse tilt-chute for trimming hooves, until being able to turn horses out to the private expanse we’re creating for them on their native turf where hooves wear naturally. Team WLP is lucky to have the heart and expertise of our lead vet and cowboy on board. 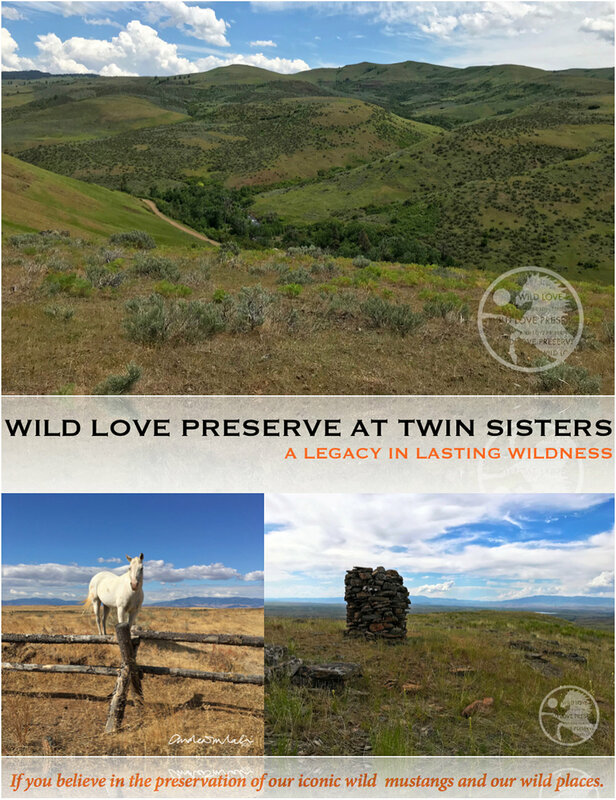 Wild Love Preserve’s legacy project includes the creation of our 10,000-acre wildlife preserve at Twin Sisters in the heart of Idaho's wild horse country, which is teeming with native wildlife and will serve as permanent home to our current 136 Challis-Idaho wild horses and future Idaho wild horses. This remarkable wild expanse is central to our work and will be protected in perpetuity, ensuring the lasting wildness of this indigenous environment as an interconnected whole for future generations through our collaborations, partnerships, youth employment and education programs, scientific research studies, eco-tourism, and youth camps. We’re working to raise the initial funding to secure this land acquisition asap so we can move WLP operations from our leased 400-acres to our permanent home, and prepare for Idaho wild horses not otherwise adopted from the upcoming Fall 2019 helicopter roundup of the Challis Herd. 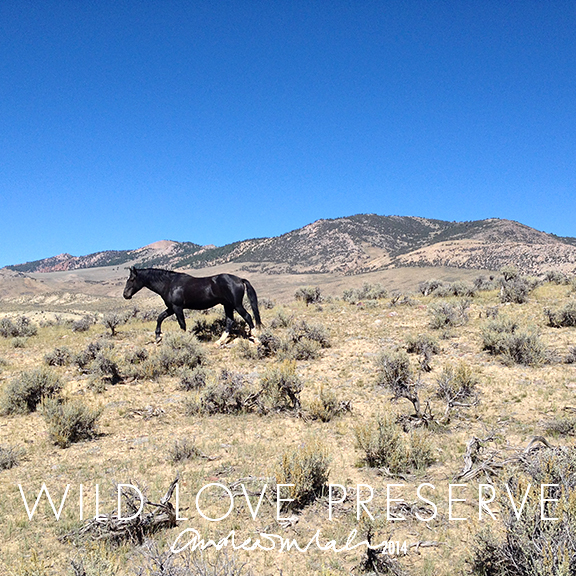 Wild Love is a WE project and together we're keeping the wild in Idaho’s wild horses and wild places. That which we do today shapes our tomorrow and we thank you for considering a tax-deductible gift in support of our Campaign for Wild Love Preserve’s 10,000-acre Wildlife Preserve at Twin Sisters. Our appreciation is immeasurable. Thank you for considering a tax-deductible contribution and for sharing our campaign with your circles. Please feel free to contact us with questions or other inquiries . Thank you for being part of Wild Love Preserve's legacy in lasting wildness. Looking back to where we started. Because Wild Love founder, Andrea Maki, is a contemporary visual artist + photographer, her art is the foundation + visual force of Wild Love Preserve. In 2010-11 her “In Wild Eyes” installation launched with purpose creating a national buzz. Here’s the backstory from the announcement. As 2018 draws to a close and we thunder towards another run around the sun, we leave you with this video from Wild Love. With your support we have been to able achieve goals many thought not possible, have saved hundreds of wild lives on their home turf, and continue our work on public and private lands in Idaho. Twenty-Eighteen also brought to fruition a hard-earned benchmark and we were excited to share news that Wild Love Preserve had our 10,000-acre wildlife preserve under contract. It takes a village to achieve big goals on behalf of our collective whole and lasting wildness. At this time we wish to Thank You for considering a year-end tax-deductible donation toward our January 30 deadline for Phase One funding of Wild Love's 10,000-acre Idaho wildlife preserve which will be protected in perpetuity... and open for you to visit once we move our 136 Challis-Idaho wild horses in 2019. 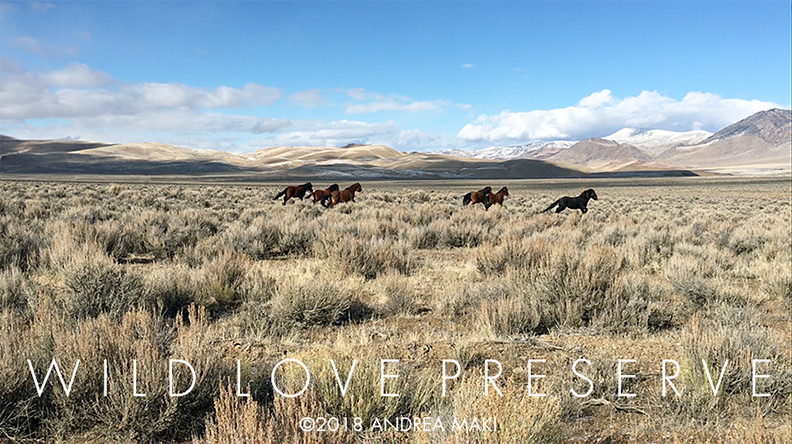 As a 501(c)3 non-profit, Wild Love Preserve engages public and private lands to address all facets of regional wild horse population on their home turf. Our legacy project includes our inclusive wild horse conservation programs, conflict resolution, education platform, comprehensive range health, and our 10,000-acre wildlife preserve in the heart of Idaho's wild horse country which is teeming with indigenous wildlife and will serve as permanent home to our current 136 Challis-Idaho wild horses and future Idaho wild horses. The work we do in Idaho serves to benefit wild horses in other regions throughout the West. Wishing You a Wild, Happy + Prosperous Twenty-Nineteen! Into the wild. Back into the light. The Winter Solstice has arriveD! On Sunday, December 16, we were notified of two stories published about Wild Love Preserve. As it turns out they have been received as "feel-good" stories for the holiday season, which is really nice, so we thought to share. The first in the international publication Horsetalk Magazine out of New Zealand. Note: For those inquiring about trips to Wild Love, as soon as we are able to get Wild Love's 136 wild horses moved to our permanent home, we will be able to start booking your visits. We look forward to sharing the wondrous wild side with you. Wild Love Calendars Now Available! How about a perfect holiday gift that spreads love all year long? 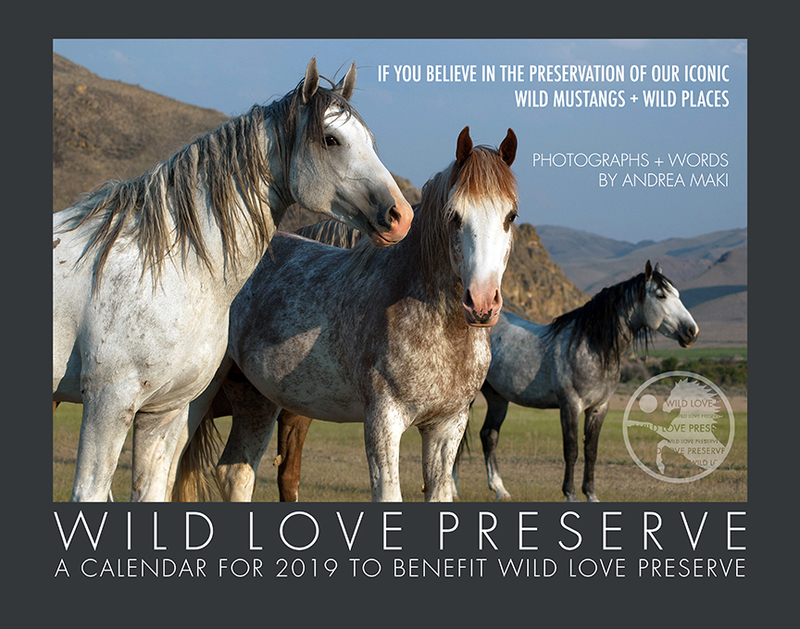 For those who have been asking: Our full-color WILD LOVE CALENDARS with a selection of favorite wild photos by Andrea Maki are now available, and in two sizes! 100% of proceeds benefit Wild Love Preserve Programs and Phase One of our campaign to raise necessary funding towards the acquisition of our 10,000-acre wildlife preserve in central Idaho and our subsequent transition from our leased 400-acres to our permanent home which will be protected in perpetuity. Calendars are available thru January. Purchase by Dec. 15 to receive by Dec. 24. 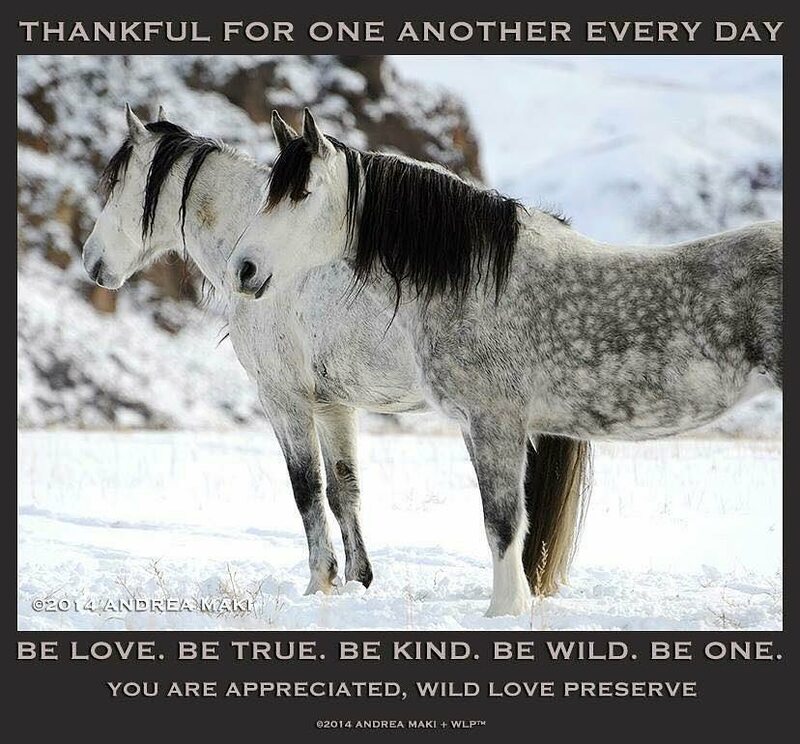 Because it resonates more than ever, this timeless message has always been cornerstone to my being, my art, and therefore, the mission of Wild Love Preserve: Be thankful for one another 365 days a year. Thank you for your belief and support in Wild Love. 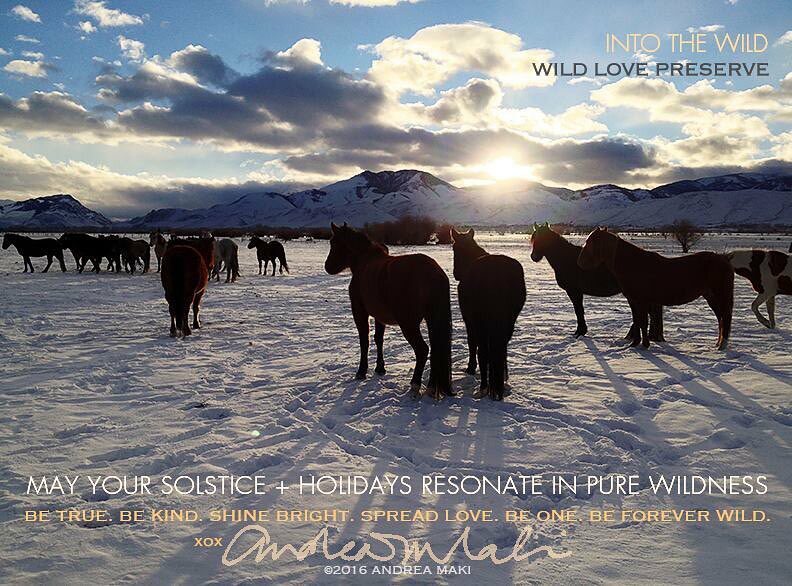 This Flashback Friday we're sharing a note from Wild Love founder, Andrea Maki. dated July 1, 2014. "Recently I was asked, “What’s in it for me?" I was told there are those who can’t believe anyone could be so altruistic as to create a project and seek a unified solution to benefit wild horses and the whole without a personal agenda lurking behind the scenes. That in this day when there is more money to be made from the “fight”, crisis and divisions versus solutions, some would believe a snake oil salesman before they would believe an individual would actually put all on the line in the name of greater good and mutual benefit. In addition, I was told, there are those who presume I have deep pockets or a silver spoon supporting WLP efforts, no matter how many times I clarify otherwise and that I have been a self-employed, self-supported, visual artist since 1988 - no security nets, inheritance or alimony. The truth, of course, is that WLP has been supported by grants and donors since inception in 2010, in addition to my personal commitment, loans and credit lines, as we prove our worth via boots-on-the-ground action while seeking full project funding. All said, I completely understand that which was shared with me, however I also find it sad and unfortunate. We are jaded for good reason and it is only natural to question truth in kindness, compassion and action on behalf of the whole, as well assume ego is in play. This is the world we currently live in, however, I also believe it is only by holding true to ones course that time and action ultimately prove otherwise. In my belief we are here to care for the whole, act with truth, kindness, respect, understanding and compassion without being plagued by ego. When engaging with those of different beliefs, common ground can be found via kindness, respect and perseverance opening doors to further discussion. We can rise above drawn lines if we so choose. Truth, sincerity, accountability, integrity, follow through and compassion are traits of my life and a reflection of the way in which I was brought up. No matter the ways of the outside, I will always take pride in walking my talk, acting my truth and being that which I personally prefer to see in terms of human co-existence. Love is action. This truth remains, as does our perseverance and due diligence.